Seven sessions of training providing skills and education on some of the most important concepts of community inclusion. 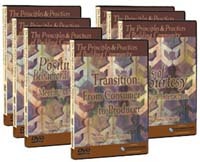 THE PRINCIPLES AND PRACTICES OF BUILDING COMMUNITY is a DVD library of compassionate, humorous and provocative training. It is for service providers or undergraduate college level instruction. Developed and presented by Dr. Thomas Pomeranz a nationally recognized authority, trainer, clinician and consultant in the field of services for people with disabilities. Dr. Pomeranz uses high quality graphic, humor and his 35 years of experience to engage his viewers. Founded in the maxim "an institution is not a place; it is a state of mind." Tom explains that individuals who have few valued relationships and few things of value are living an "institutional life." It introduces the concept of "disabilityism" explaining how one's behavior may unwittingly cause one to behave in a discriminatory manner. Tom discusses a variety of tools - "skills of courtesy" that may be exercised to support others in improving the quality of their lives. Dr. Pomeranz decisively dispels the myth "they are children in adult bodies." The implications of developmental age and mental age are thoroughly explored. Introduces a variety of age-appropriate training and leisure materials that are desired by individuals with developmental disabilities. Through the sharing of tales, attendees will increase their sensitivity to adults with developmental disabilities utilizing age-appropriate media and behaviors. Deviancy-competency hypothesis will be discussed as to its importance in encouraging adults with developmental disabilities to select age-appropriate items. The maxim that "without a presence, there is no future" serves as the foundation for this session. Details how supports should be delivered to allow individuals with significant cognitive, physical and/or behavioral challenges to participate in all aspects of their life. The session provides participants with insight as to how our perceptions and expectations serve as barriers in providing support. The four supported routine outcomes (facilitating connections, maximizing independence, enhancing self-worth, and producing self-determination) are detailed and their life enhancing effects are reviewed. Dealing with anger and its consequences is one of the most difficult and important challenges we face in supporting people with developmental disabilities. This presentation is focused to provide "best practice approaches" which will assist in supporting others in diminishing the causes of anger. In this presentation Dr. Pomeranz assesses the medical/biological, psychological/psychiatric and environmental influences of socially inappropriate behavior. Emphasis is placed on proactive strategies to identify and respond to the unmet needs of the individual. Limitations of classical behavior management approaches are discussed. Through example and short story Tom makes it clear that "anger communicates unmet need." Heightens sensitivities to the impact of language in promoting respectful relationships. The evolution of slang references that devalue people in numerous examples of insensitive language are presented with the Universal Language alternative. Provides viewers with strategies to master Universal Languages as well as sensitively supporting others who struggle in using words of respect. It is the outcome of this session "that the words and language we use in talking about our friends - the words and language they use in talking about us", will serve as the standard in how we speak to and about people with disabilities - "It's all in how you say it." Dr. Pomeranz focuses on the fundamental strategies of promoting independence and self-determination. The instructional strategies address: verbal prompting, training materials usage, physical queuing, physical prompting, backward chaining, graduated guidance, successive approximations, proximity control and environmental engineering. Provides attendees with intensive hands on experience of best practice technology for facilitating skill acquisition. Through demonstration and role-play, attendees will enhance their skills in training "direct support professionals" in effectively teaching individuals: daily living, vocational, leisure, social and community participation skills. The session also reinforces the precept that an essential responsibility of all support staff is to emancipate the individuals they support - from unnecessary dependence. Meet Dana, a feisty, funny, and charming 25-year-old at a crossroads... but not the kind you'd expect. The stories of three families show us what the textbooks and studies cannot - what it's really like to love and care for children with autism. An intensely personal film about growing up with Asperger Syndrome, following 12-year-old Adam as he struggles to make sense of bullies, girls, and life in the real world.